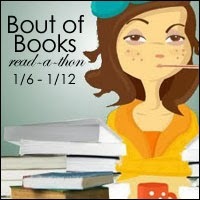 I've decided to participate in the Bout of Books read-a-thon 9.0 in January! This'll be my third go at the read-a-thon, and I'm incredibly excited to be doing it again. As it gets closer to the starting date, I'll post my goals and the books I aim to read within the week. See you then!